You can order your copy online here, or pick up your copy in stores for just £1 now! I'm delighted to present HFM's very first catwalk special in this bumper fashion issue – a whopping 50-page treat to tantalise and inspire you, covering all the key shows from the fashion capitals of New York, London, Milan and Paris. With expert commentary and beautiful presented imagery, we put the fun into fashion and give you a front row seat. 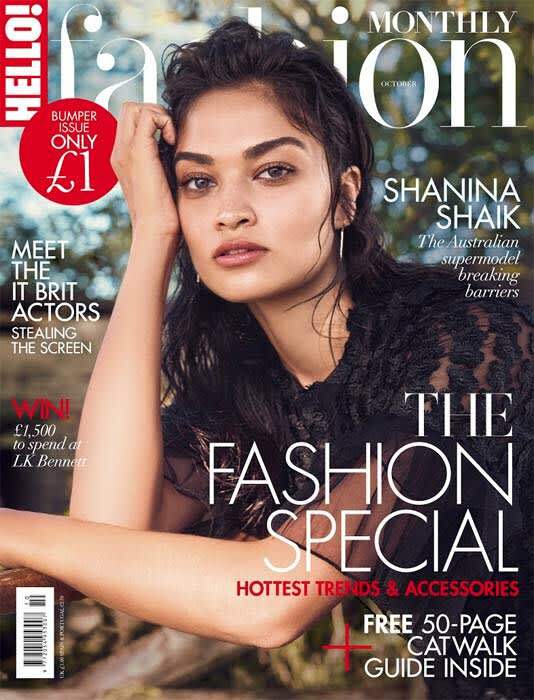 Seasonally, it's been a bit upside down for me since decamping to Sydney mid British summer for our cover shoot with Shanina Shaik. While it may have left me feeling more sun-deprived than usual, it was the perfect place to showcase the new autumn/winter offerings and catch up with the Victoria's Secret star, who grew up in Melbourne. One of the most exciting young models on the international circuit today, she chatted candidly about being bullied at school, her engagement to her fiancé, DJ Ruckus, and why she refuses to be categorised on the catwalk. I was intrigued to learn about some of the young, homegrown stars making an impact on our screens, both big and small. We went behind the scenes to find out what motivates the likes of Josh O'Connor (ITV's The Durrells), Raffey Cassidy (blockbuster Tomorrowland) and Stefanie Martini (cast as the young Jane Tennison in the new Prime Suspect prequel) as they navigate this highly competitive profession. A box set of nail polishes from Soigné Nails anyone? Snap your best mani and enter our #myHFM Instagram competition!